Frank Heptner is Senior Director Consultancy and Projects Intralogistics Solutions at Linde Material Handling. In an interview he talks about digital networking, automation and the future of intralogistics. 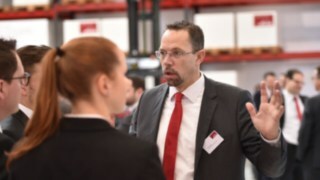 Mr. Heptner, you spoke at the LogiMAT 2018 in Stuttgart about automatic intralogistics solutions and digital networking. How will networking shape the future of intralogistics? Intelligent networking will play a key role in shaping intralogistics. Vehicles and equipment already move autonomously and carry out warehousing and transport tasks. However, they often still work independently and are only slightly networked. That will change in the future. Once all resources are connected via a central IT system such as a warehouse management software, we know their location, their operating status and their current activity at all times. In this way, all processes can be optimally controlled from a higher level. Of course, this also applies to manually operated vehicles. Their work can be coordinated much more efficiently if all their position and operating data converge in a truck control system and this system intelligently coordinates the processes. The great potential for efficiency lies in digital networking. How does this affect the complexity of everyday warehouse routine? The complexity of today's daily warehouse routine results from the constantly increasing demands on delivery processes. Consumers order highly individualized products and expect very short delivery times. In addition, the package sizes change continuously depending on the application. To master this complexity, material handling processes must become more efficient and flexible. The efficiency of a single truck is no longer as important. Digital networking, on the other hand, offers great potential for efficiency. If all components are intelligently networked, all steps of highly complex processes can be coordinated in real time and adapted to the respective situation. How will automation affect the work of the fleet manager? 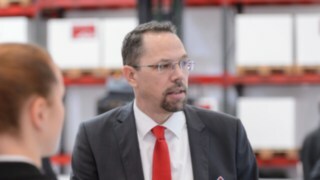 Frank Heptner, Senior Director Consultancy and Projects Intralogistics Solutions, explains the future of intralogistics. His role will change in any case. In automation, different IT systems exchange information and make decisions on this basis. For example, whether a vehicle needs to be replaced. The fleet manager then has nothing more to do with such processes. Instead of taking care of individual process steps, the focus of his work will rather be on optimizing the overall system. For example, by analyzing data prepared by the system and making decisions based on it. An increasing degree of automation and networking means that customers can use their resources and systems in the intralogistics process more efficiently and more precisely. What concrete benefits can customers expect from increasing networking and automation? An increasing degree of automation and networking means that customers can use their resources and systems in the intralogistics process in an ever more efficient and more precise manner. This is possible because the technologies are in mutual exchange and therefore all available vehicles and systems are used optimally. This contributes to considerable cost savings and is combined with a high degree of flexibility. Digital networking also ensures that the entire process becomes increasingly transparent. The overall system achieves extremely high reliability and thus improves delivery quality. At the same time, safety in the warehouse benefits from this development. The interaction of the networked components enables targeted control and thus reduces the risk of collisions and accidents. How should customers approach automation and digital networking? This cannot be generally answered, since it depends strongly on the use cases and initial situations of the customer. Intralogistics is an important core process, which is responsible for ensuring that the goods are in the right place at the right time and in the right quantity. The focus is therefore on the material flows, which must function as a whole. This forms the basis for digital networking and automation. Large companies such as automobile manufacturers usually have a great deal of their own expertise in this area, while other companies hardly have any material flow know-how of their own. First of all, it is always important to look at the whole picture. Already at this point we can support the customer and define the processes together. What would that look like in concrete terms? In a project, the customer should consider all significant influences on the logistics process right from the start. Regardless of whether he is optimizing his processes or planning a completely new warehouse. The higher the level of complexity and automation, the sooner we should work closely with it. It is not enough just to supply it with vehicles and applications. We need to know its resources, its systems, its equipment and its software and understand all the factors that determine its processes. This is the only way we can give him the best consulting. 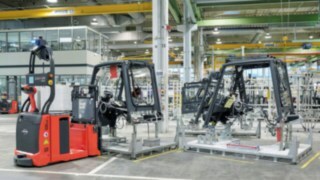 What role does Linde Material Handling play in this? We provide the customer with support from planning to implementation. We analyse what already exists in the warehouse, how the overall structure of its infrastructure works and which IT systems are used. On this basis we find modular solutions that suits his processes and his IT landscape exactly. What do customers have to consider if they want to automate their warehouse? In order to implement automation solutions, information must be transmitted via W-Lan in real time. This is the only way for the system to know where vehicles, devices and people are at any time. These requirements are often not yet met by customers. Then we first help them to create the appropriate IT infrastructure. Because without it, everything remains theory. In your presentation at LogiMAT you mentioned a solution called Zone Control. What is this about? Zone Control allows you to control the processes of a networked system by defining zones and assigning commands to them. For example, automatic speed reduction can be defined for areas where forklifts often meet. The drivers cannot drive too fast because the system does not allow it. It is also possible to define vehicle-specific changes for zones, such as a lift height limitation. Or you can set a traffic restriction for certain vehicles in certain zones in order to distribute the traffic volume more sensibly. The technology is there, but the conditions on the ground must be right. That's the first step. In the future, intelligent digital networking will open up even more possibilities for this. Mr Heptner, thank you very much for this interview.